You must be aware or perhaps you have considered the impact that a well presented street map, featuring your business or organization could have on the buying public. 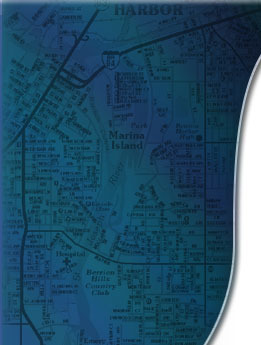 Our custom maps are designed to your specifications in one or two colors on 50lb offset stock. We utilize all sources available to us in compiling cartographic information, and, of course, you receive a proof prior to printing. Our prices include all cartography work, ad layout and production costs. You can pinpoint your locations, highlight points of interest, add any physical landmarks and even choose your company's colors. This is a powerful and effective personalized company promotion with far reaching and long lasting results. Maps are the #1 requested item by newcomers to town and a favorite for current residents. A custom map has your company's information, message or ad placements exclusively. Custom maps have real value, (retail for $4.95 each) people reuse them and remember you. Maps last for at least 4 to 5 years. Custom maps allow you to assist customers in locating places and points of interest that you want them to find! Pre-folded to fit into a standard #10 envelope. Free display-for-distribution boxes are available. Laminated Wall Displays that work with dry erase markers are also available. Please call us at 513-870-9000 and ask for Don Mueller.